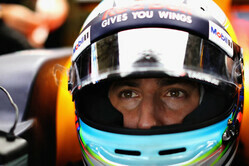 Daniel Ricciardo: "I'm pretty happy with Friday. For what we've got here we looked competitive. The long runs looked okay but the Mercs looked really strong. We can definitely find a little bit more for tomorrow but I don't think we're far off and we don't have to make many changes tonight. It's never a circuit where we have dominated in the past so to be close to Ferrari and at least in the fight with them seems positive. I'd like some rain for Qualifying tomorrow and I can try and fight for pole. I know if I get it I won't start there because of my penalty, but anyway it would be good to start 11th for the race. That's my target." Max Verstappen: "My Friday has been ok. It could have been a bit better and we still need to improve the balance, but in general it was a decent practice day. I was struggling for grip this morning and we managed to improve that a bit this afternoon but there is still more work to be done. On the short run it was not ideal on the Supersoft but we are not too far off on the long runs. Of course I always want to go faster and Mercedes are quicker than us at the moment. We need to make improvements before tomorrow because we know that in Qualifying they will step up their engine. I think we need to be at least the same speed or faster than Mercedes in the final practice to have a chance of getting on the front row of the grid." Horner: Engine negativity is "filibustering"